Note: The blood takes the shape of the stored vessel so it looks like a liver. Wash the blood both side gently don’t squeeze it. 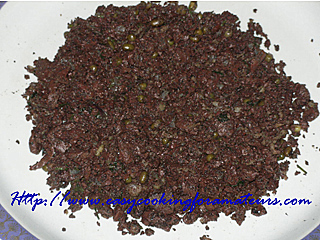 Cook whole green lenthils/hesaru kalu with salt till it becomes soft & drain water, keep aside . In a pan boil water & put the blood in it. Let it boil till the colour changes to brown. Drain the water & mash the cooked blood. Add onion sauté it till light brown. Add the cooked whole green lenthils/hesaru kalu sauté it for 2min. Add the cooked blood & mix well. Add salt & pepper powder sauté it, so that blood gets coated. Add coriander & grated coconut mix well. Keep it in low flame for 5min. Mix well & off the stove.